Anand Chandrasekaran, chief product officer of Snapdeal, and Mekin Maheshwari, ex-chief people officer with Flipkart, also participated in the funding round, alongside Akshay Syal, Richard Kim, Jana Pokkalla and Manish Gautam. Chandrasekaran has previously invested in Pluss/Gigstart, Audeze, InnerChef and Instalively. The company plans to primarily use the money for building team and partnerships. Founded in 2014, Aisle claims around 500-800 registrations per day, and is active in 50 countries. The startup is led by Able Joseph, who is founder and CEO; Bivin Benny, director - user relations, and Razee Marikar, CTO. Benny has earlier worked with Ogilvy & Mather and Flipkart while Marikar is an ex-Akamai executive. Harshad Lahoti, founder and CEO of ah! Ventures, said, "Online dating has seen little innovation in the past couple of decades. Rarely do we see a dating app that is monetised from day one. When Aisle reached out to us, we instantly realised the potential of the product and the traction that it had gained." Sonia Pradhan, TermSheet COO, said this is the second time it has facilitated a funding round for Aisle. TermSheet, led by Vivek Durai and Pradhan, is a platform that automates deal discovery, orchestration and closing. More than 450 investors have signed up for TermSheet since its launch in December 2014. It has closed eight seed investments and is currently closing its ninth deal with three more in the pipeline. ah! Ventures has to date invested close to Rs 70 crore in over 22 startups spread across varied industries and domains, including Aisle. ah! Ventures is closing two more deals in the coming weeks. The dating and matchmaking apps industry in India has been gaining momentum with many players entering the market and raising funding. 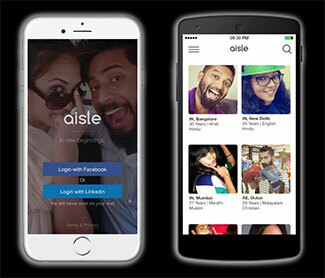 Last month, Dil Mil, a matchmaking app for South Asian expatriates, raised an undisclosed amount in funding from one of the founders of US-based music streaming app Saavn (South Asian Audio Video Network). Matrimony.com Pvt Ltd, which runs a number of matrimony-based sites, including BharatMatrimony.com, launched Matchify.com in April last year under Matchify Services Pvt Ltd. People Group, which runs Shaadi.com, invested an undisclosed amount for a minority stake in Delhi- and Singapore-based Thrill Pte Ltd, a mobile dating startup. Truly Madly had raised $5.5 million in Series A from Helion Venture Partners and Kae Capital in March 2015. In July, iCrushiFlush raised an undisclosed amount in pre-Series A funding from IDG Ventures. Early this month, US-based Tinder launched its operations in India and appointed Taru Kapoor as country head. Another venture in this space was Ignighter that was rebranded as StepOut and later acquired by Match.com.